A billboard, in the northeast London district of Walthamstow, quotes former Foreign Secretary Boris Johnson as saying this in the House of Commons in 2017: "There is no plan for 'no deal,' because we're going to get a great deal." In the rush of digital news that washes over so many of us every day, it's hard to remember what a politician might have said or promised several weeks ago, let alone several years. Some activists in the United Kingdom have come up with an imaginative, seemingly old-fashioned solution to this modern-day problem. They plan to put up at least 150 billboards across the U.K. quoting some of the promises and rosy predictions politicians made about Brexit in recent years so people can reconsider them amid the political chaos that has followed. "There is something about the digital news cycle where all these kind of untruths and lies just fly past you and you forget about them," says Chris, one of the activists. "We thought if we put them up in the real world, you have to stand there, and look at them and digest them." Chris, like the other activists, declined to give his full name, because they had previously illegally commandeered billboards to put up their messages and fear prosecution. Now, though, they've gone legit, raising more than $188,000 in a crowdfunding campaign to buy the outdoor ad space and racking up more than 55,000 followers in about a month on Twitter. The group is called Led By Donkeys. It's a play on a phrase, "Lions led by donkeys," that was used to describe British infantrymen led by incompetent generals during World War I. One of the activists, Richard, says pro-Brexit politicians conned Britons into voting to leave the European Union in the landmark 2016 referendum. He says Brexiteers made extravagant claims about how much money the U.K. would get back from the EU and how easy it would be to not only negotiate the U.K.'s departure, but also to cut a new free trade deal with Brussels. Led By Donkeys wants the billboard campaign to encourage citizens to hold public officials accountable. "They were promised a utopia where the European Union would crumble before our awesome negotiating power and all the problems of Britain would disappear," says Richard, "so we feel we're kind of performing a public information service." The group Led By Donkeys paid to have a billboard put up in London's West Kensington section that quotes Jacob Rees-Mogg saying in Parliament in 2011: "We could have two referendums. As it happens, it might make more sense to have the second referendum after the renegotiation is completed." In the beginning, Led By Donkeys asked Twitter followers to weigh in on which Brexit statements to put up. The billboards are designed to look like giant tweets, though many of the statements were actually spoken in the U.K.'s House of Commons, which is indicated at the bottom of the signs. One billboard in the English city of Birmingham quotes John Redwood, a member of Prime Minister Theresa May's Conservative Party, tweeting in 2016: "Getting out of the EU can be quick and easy – the UK holds most of the cards in any negotiation." 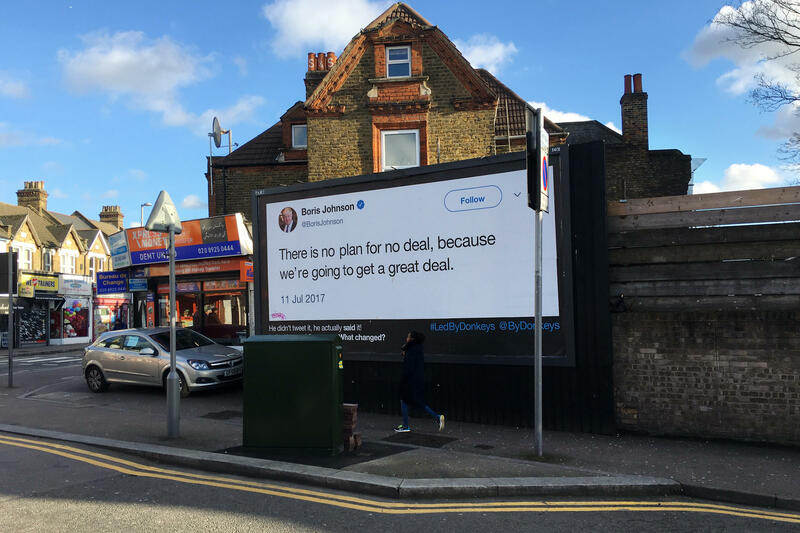 Another billboard, in the northeast London district of Walthamstow, quotes former Foreign Secretary Boris Johnson as saying this in the House of Commons in 2017: "There is no plan for 'no deal,' because we're going to get a great deal." Jordan Johnson (no relation to the pro-Brexit politician), who works in business administration with a construction company, rolls up on his skateboard and looks at Boris Johnson's words on the billboard. Asked if the U.K.'s deal with the EU is a good one, the 22-year-old says: "It's not, not at all. The promises have most definitely not come true." In fact, Parliament hates the deal the prime minister struck with Brussels so much that last month lawmakers voted it down by a historic margin of 230 votes. With little more than six weeks before Britain's March 29 exit date, May still doesn't have a deal British lawmakers will support. The risk of walking away from the EU's massive market with no agreement continues to grow. "We were so patriotic, we didn't think of a backup plan," says Jordan Johnson. He thinks the Led By Donkeys campaign is "brilliant, because whether you agree with it or don't agree with it, it will get you to think." Others, though, are not impressed, including Jacob Rees-Mogg, a Conservative member of Parliament. 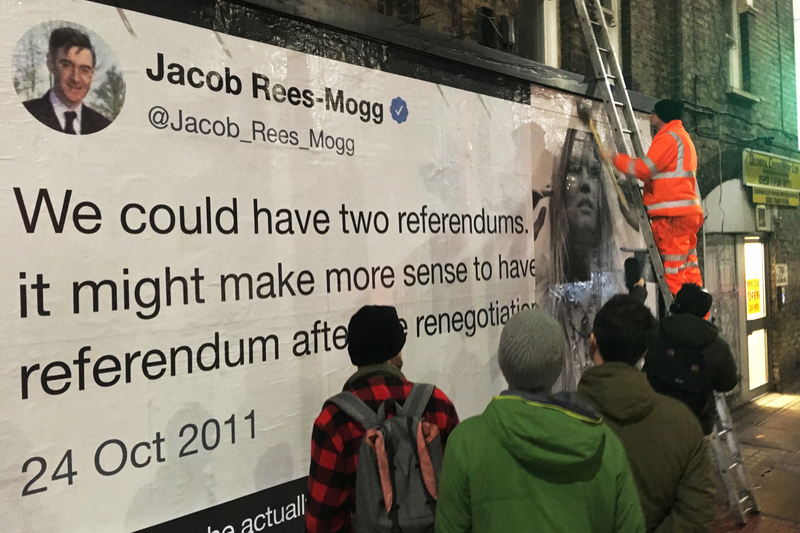 A billboard in London's West Kensington section quotes Rees-Mogg saying in Parliament in 2011: "We could have two referendums. As it happens, it might make more sense to have the second referendum after the renegotiation is completed." That seems to imply that Rees-Mogg, who has opposed a second Brexit referendum, was once in favor of it. But Rees-Mogg, an arch Brexiteer, said in a statement to reporters that the quote is misleading and "highly selective." He said he was talking at the time about votes on a renegotiated relationship with the EU, not leaving the EU. David Wood, the worker who put up that Rees-Mogg billboard in London last week, didn't pay much attention to its content. Like so many in the U.K., he is sick of Brexit. Led By Donkeys and some pro-EU politicians want to see a second Brexit referendum on the grounds that voters were misled during the first one, but Wood is against it. "We've already voted once, we voted to leave, and it was democratically done," says Wood, wearing orange reflective overalls and working with a ladder, bucket and a giant brush. "Just because they don't like it, doesn't mean we should have another one." Some activists in Britain are determined to make sure the public never forgets what they were promised. In 2016, some British politicians made rosy predictions. They said if Britain just voted to leave the European Union, the move would be easy and profitable. Now that Britain is struggling to find any agreement to leave at all, activists are posting those old predictions on billboards. NPR's Frank Langfitt reports. FRANK LANGFITT, BYLINE: So it's about 6 o'clock in the morning here in west London. And there are these three dads. They're working on a project to put up billboards. It's a group that call themselves Led By Donkeys. It's a British expression for incompetent leadership. And the billboard going up at the moment looks like a screenshot of a tweet quoting an arch Brexiteer. Now, one of these guys - his name is Chris. He says this whole thing is about government accountability. CHRIS: It really started off as a project to expose the outrageous lies of some of the politicians who are pushing this whole Brexit project. And we just started out pasting up a few of these, designed as tweets. And then the public decided they wanted to see dozens and dozens of them. So we raised this money. And now we're putting them up all over the country to remind people of what our leaders said a couple of years ago when this whole Brexit thing kicked off. LANGFITT: These guys, they've raised more than $180,000 in a crowdfunding campaign to put up these billboards around the U.K. But they don't want to use their full names. And the reason is because in the past, they actually commandeered billboards illegally. They're afraid they could be prosecuted. Now, one of the activists - his name is Richard. He says they're doing this whole thing because they feel that back in 2016, British voters were calm. RICHARD: They were promised a utopia, where the European Union would crumble before our awesome negotiating power and all of the problems of Britain would disappear. So we feel we're kind of performing a public information service. LANGFITT: Now, the kinds of quotes that they're putting up include this one from 2016. It's from a Brexiteer named Sir John Redwood. He's a member of parliament. And this is what he said. Getting out of the EU can be quick and easy. The U.K. holds most of the cards in any negotiation. Well, that's proved not to be true at all. In fact, after two years of negotiation, the EU very much has the upper hand. The British Parliament so hates the deal the EU has given them that they voted it down by a historic margin. But I was also wondering, you know, in the age of digital politics, why put up billboards? Now, this is what Chris said. CHRIS: There's something about that digital news cycle where all these kind of untruths and lies just fly past you, and you forget about them. So we thought if we put them up in the real world, you kind of have to stand there and look at them and digest them. AUTOMATED VOICE: The next station is Walthamstow Central. LANGFITT: So I wanted to see if this really works. So I took the Tube across town over here to northeast London. LANGFITT: And this is where I ran into Jordan Johnson. He just rolled up on a skateboard. And I asked Jordan to read the quote on the billboard, which is from Boris Johnson - no relation - who's a member of parliament and, like, a big Brexiteer. JORDAN JOHNSON: There is no plan for no deal because we're going to get a great deal. LANGFITT: Is the United Kingdom getting a great deal from the EU right now? JOHNSON: Not at all, not a great deal. I would not call it that. The promises have most definitely not come true. We are so, like, patriotic. But we didn't even think of, like, backup plan, what could go wrong - them kind of things. LANGFITT: What do you think of the whole idea of this Led By Donkeys campaign? JOHNSON: This campaign is - I think it's brilliant because whether you agree with it or you disagree with it, it'll get you to think. LANGFITT: Others don't like the campaign. There's one billboard. It quotes Jacob Rees-Mogg - he's also a big Brexiteer, member of parliament - saying back in 2011 that he would support a second Brexit referendum, which he now publicly says he's very much against. Now, Jacob Rees-Mogg actually says he never backed such a vote in the first place. And the quote is really selective, way out of context. LANGFITT: Back in west London, David Wood - he's a worker - he's pasting up the latest billboard. But he hasn't been paying much attention to it. And the reason is, like a lot of people here in the U.K., he's sick of Brexit. He also doesn't believe there should be a second referendum on the grounds that earlier voters were misled. DAVID WOOD: We've already voted once. And we voted to leave. And it was democratically done. Just because they don't like it doesn't mean we should have another one. LANGFITT: Led By Donkeys plans to use all this crowdfunding money to put up at least 150 billboards around the country. And what they hope is in the rush of the digital age, people will actually stop and look and think about what the politicians promised, what's actually happened and hold their elected officials accountable. Frank Langfitt, NPR News, London. Transcript provided by NPR, Copyright NPR.